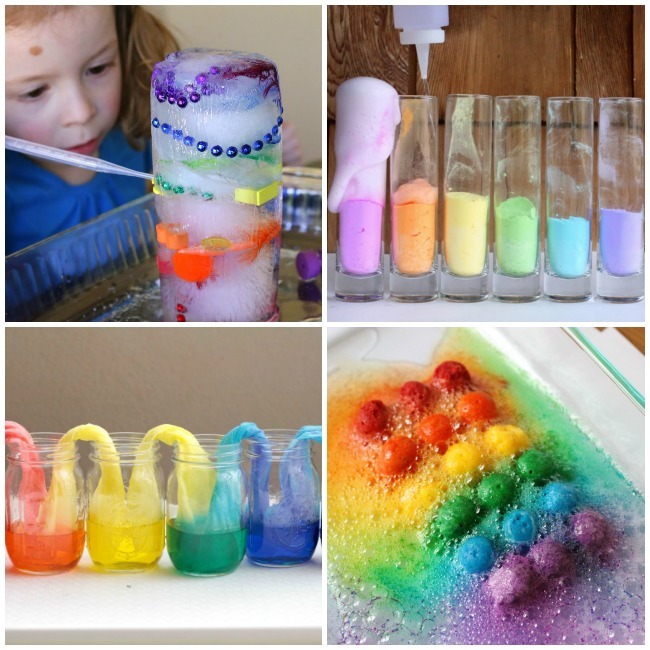 20+ Rainbow Science Experiments Your Kids Will Go Crazy Over! Rainbows are one of my favorite parts of Spring. It usually means that the sun is shining and I’m always happy with that. Even though it usually means it is raining as well, but I’ll take the sunshine when I can get it! Incorporating rainbows in science activities is not only fun but super easy. 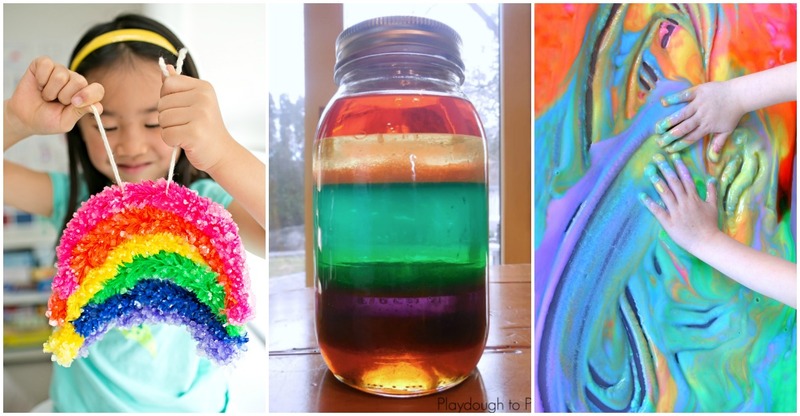 These Rainbow Science activities are perfect for the classroom or at home. Most of them don’t require much prep but all of them will have kids smiling in science giddiness! 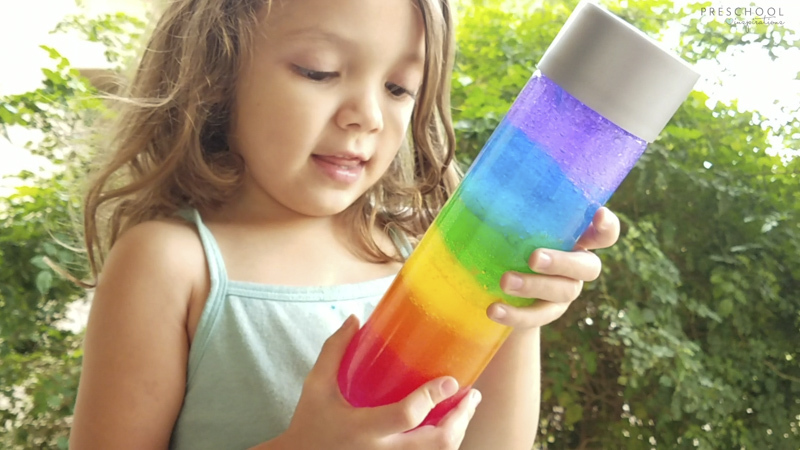 Finally a rainbow discovery bottle that the colors don’t run together! I’ve been trying and experimenting for a while now and finally figured it out! It’s not quite liquid and not solid either. It’s a perfect combination of awesomeness! Want to make one of your own? The full tutorial is here. We’ve all done baking soda and vinegar experiments, right? This Baking Soda & Vinegar Reaction though is the most colorful I have seen and I can just imagine how excited kids will be to see the rainbow foam explosions! Oil and water make science experiments super easy and fun. This Rainbow Jar is extra fun, not only because of the colors, but it is mesmerizing how the colors stack up on top of each other! These candies are fun to eat but even more fun to play with. This Skittle Rainbow is beyond the best candy experiment I have seen. I could watch this for hours! Chromatography is a fun way to incorporate science and art together. These Rainbow Filters are fun to create but then also fun to create with! Did you know that dish soap can do magical things? This Magic Rainbow Milk is purely magical. The colors move seemingly on their own, but are they moving on their own? When science and sensory connect, it is always a great activity. This Scented Rainbow Science is perfect for sensory seekers! Plus, adding the scent is probably the easiest part! This Exploding Rainbow is exciting to create and even more exciting to watch. Kids will enjoy these hands-on mini ‘explosion’. Even if we know it is only a simple reaction, kids will love to pretend their rainbows are exploding! There is something incredibly fun about swirling your hand around in a big bowl of soap foam! This Rainbow Foam Bubbles activity is not only a fun sensory activity but also helps teach about color mixing as well. Rainbows are pretty but Giant Crystal Rainbows are even more beautiful. Kids will enjoy watching the crystals grow on their rainbow! It may take a day but the magic of the crystallizing process will not be lost! This Fizzy Rainbow Slush takes baking soda and vinegar to a whole new level. Plus if it is hot outside, you can place this slush in the fridge for a while and the kids can play in cold slush! This Rainbow Sugar Water Density shows that adding sugar to colored water can help the colors separate instead of mixing together, which is excellent for younger children. This is also a fantastic way to introduce or teach about density for older children! Pumpkin Seeds are not only for fall. These Pumpkin Seed Discovery Bottles are rainbow all the way and is a go-to activity for any time of the year! Do your kids love playing with ice? And melting ice with hot water? This Rainbow Ice Tower is filled with colorful items frozen into a tower and the excitement is getting them out! I can see kids being occupied for quite a while with this one! Science these days is not complete without slime and this Rainbow Slime is a MUST. It is absolutely beautiful how the colors connect but don’t mold together. This recipe is anything but icky! Just like with the skittles experiment above, this M&M Rainbows is mesmerizing! It is incredible how candy can taste AND look so beautiful! I love how this Erupting Rainbow comes out of little test tubes. Kids will feel like real scientists even though this experiment is incredibly simple! This twisted rainbow is sparkly in all the right ways. Kids will enjoy creating this Salt Crystal Rainbow and displaying it all Spring long! Sometimes science is simple and other times it is purely magical. The art that this Rainbow Paper experiment can make is fantastic! This would be beautiful to put on the front of cards or notes! This Walking Rainbow experiment has me screaming HOW in my head. I want to explore this experiment because it just looks unreal. Science is so fascinating and this is one of those worldly mysteries that would be fun to solve! This Ice & Salt Rainbow actually creates craters. As pretty as it is, it can do crazy things when combined together. This would be a fun science activity to add to a small world play with dinosaurs or superheroes! This Rainbow Colored Ants activity is purely fascinating. This would be a fun lesson to teach for either a bug unit or even Spring. Super interesting! Rainbows are beautiful in the sky and can create magic in the real world. 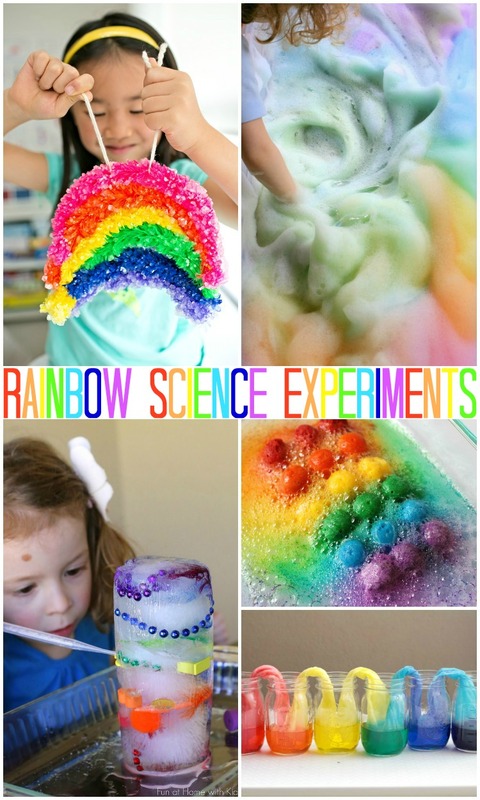 These Rainbow Science activities are a close second to being magical in the real world. Whether you are teaching a spring unit, teaching about the weather or just wanting some fun colorful activities – these science activities are sure to please!